Facebook -- facing increasing negative reaction to its Facebook Home launcher as AT&T (at least temporarily) dropped the price of the HTC First to a mere 99 cents -- has silently added support for the HTC One as well as unofficial support for the Samsung Galaxy S4. The change comes as the official Facebook app received an update just hours after Facebook held a small press conference at its campus in Silicon Valley, touting some 1 million total installations, apparently without listing how many active installations it has. (And that still wouldn't account for anyone who has installed Facebook Home but isn't actually using it.) Following that event, the Facebook application itself received an update. The Facebook Home launcher has not been updated as of April 22. That brings us to the Samsung Galaxy S4, which you see above. Without a mention in any changelog in any of the Facebook Apps, our Galaxy S4 now show the option to "Use Home Anyway." Tap it, and Facebook Home launches just fine. Same goes for the Sony Xperia ZL. 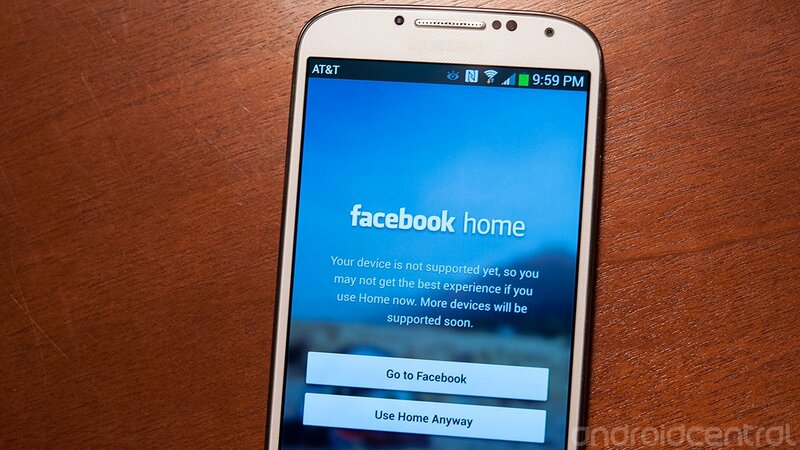 Additionally, Facebook Home is working without this "Use Home Anyway" intercept on the HTC One. It wouldn't surprise us in the least to see it working -- with or without the warning -- on other devices. Both the HTC One and Galaxy S4 were listed as "supported" devices when Facebook Home was announced, but until now they'd been unable to officially run the launcher. Also, the Facebook app update has added a new notification -- a persistent "ongoing" notification that lives in your notification pull-down. You can turn it off in the settings menu. If you've been waiting to try Facebook Home but your device hasn't been supported -- and let's face it, that's probably not a whole hell of a lot of you reading this -- give it a shot now.